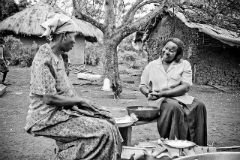 In the East of Uganda two existing loan programmes have been successful and a number of participants now want to take out larger loans that have extended repayment periods. The existing programmes could cope with a few of these larger loans, but many people are asking for them. A major desired outcome from micro-loan programmes is that, at some stage, the people who are successful will be able to move into the mainstream banking system. However, the gap between the small scale programmes and the mainstream is still too wide so another loan programme has been started to assist those requiring larger loans. As many of these people are purchasing large items there are some extra conditions to getting a loan. Each person must obtain a recommendation from their LC 1, this is the local elected representative. They must have some security and at the time of purchase one of the loan managers will go with them to purchase the item and to take the ownership papers until the loan is repaid. 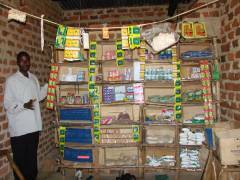 For many years BHW has been working with the team at CFC-CCM (UGA02) to grow a micro-loan programme in the area. It is becoming a very effective programme and many families have been developed through it. At any one time there are around 115 families with loans for various businesses. One of the key people from this programme shifted to Mbale some years ago. 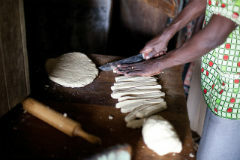 She commenced a loan programme and more than 30 people, mainly widows, benefit from the loans at any one time (UGA05). In both these programmes, as time has gone by, the successful loanees have been asking for larger loans. A fund has therefore been set up from which people can take larger loans. This was commenced in 2013 as a pilot and it will be assessed again in 2014 to observe progress. Some will want to borrow much more than that of course. 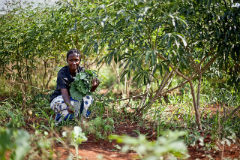 This loan programme is a natural part of growing the capacity of those in the smaller programmes. It would be a pity if they are successful at a small level but then cannot bridge to larger operations and enterprises. It is part of two robust programmes we have been working with for a long time so the leadership is established and BHW has a good relationship with them. 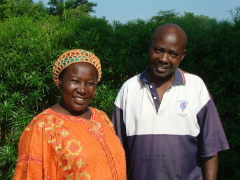 James and Gorret have lived in the community of Busia much of their lives. James has lived in this village all his life. Currently he is the headmaster of a primary school some kilometres from his home. Gorret looks after their children but is a very busy woman with other roles as well. James' role in CFC-CCM is the CEO. He does this in his spare time! He pastors the church in his village with about 200 members, oversees and participates in church planting programmes, visits around the 20 or so churches in the district and generally keeps people accountable. Gorret oversees the development of the loan and micro-enterprise programmes and travels around the district running seminars, training, and holding accountability meetings for the various clubs that have formed. Also involved is Christopher Odeya. He is married to Aida and they have five children. Christopher is a product of the education programme that is part of the UGA02 partnership. He had dropped out of school in S2 and for nine years was not going to school. At the age of 29 he went back to S2 and completed secondary school in 2006. He was helped to finish his education by the CFC-CCM partnership and is also a member of the loan programme. 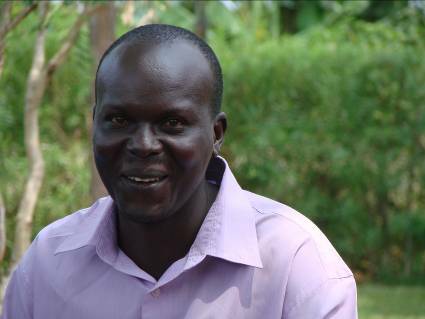 He will be the main administrator of this expanded loan programme for the Busia area. The vision is to empower loan beneficiaries to grow their business to another level without compromising the existing loan programmes. It has commenced with one group project in Mbale and eight loans to individuals in Busia. The loans are being used to buy motorbikes for taxis, enlarge a bakery, purchase land, build houses, and grain and fish trading. 2013 / 2014 is a pilot year to see how this develops and to learn from the growth. There is little risk as these people are well known to CFC-CCM and have a history of repayments. An initial amount of $US33,000 has been set aside to get this operational. More will be added from time to time if required.